In one of my previous articles I wrote about some options available to keep track of your code as it evolves. We assesed main options for freelance developers: Git and Mercurial, and main cloud providers for these two: GitHub and Bitbucket. My conclusion then was that, as I'm currently a Python developer, my logical choice was Mercurial and Bitbucket, very typical in Python community. In this article we're going to learn main commands to use Mercurial and keep a cloud repository in Bitbucket. Mercurial has installer for Windows, Linux and MacOS. Besides you can choose to use a graphical user interface to manage it (like TortoiseHg) or just console commands. In this tutorial we're going to focus in Linux version (actually Ubuntu version) with console commands. Using just console commands has the main advantage that is easier to explain and concepts are clearer. Change that content to include your own username and email and you have it, that's all configuration you need for Mercurial. Graphlog stuff will let us get useful information when we get explanations about branches, here in this article. Now you can see it, Mercurial uses ".hg" dir. Inside it, Mercurial will store our versions of code's files. While ".hg" folder stays safe our code will be too. Now question marks changed to "A" which means those files are recently added to repository. This time we have added files one by one, but we could have added them in one round just doing "hg add .". We could have used wildcards too. Besides we can create exclusion lists creating a ".hgignore" file inside of source folder. This way you can fine graine choose which files include in Mercurial tracking and which not. For instance you usually will tend to keep in repository source code but not compiled files (from that source) or test databases that can be regenerated easily. You'd better store in your Mercurial repository only really needed files to keep your repository size as small as possible. Keep in mind that, if you want to backup a repository to Bitbucket (or any other source code hoster), you will have a maximum size limit for your cloud repository if you want to stay as free user. "hg log" shows commit history. We can see through that history that last update message was fixed thanks to "--amend" flag. Unfortunately with "-amend" you can only fix last commit. Changing an older commit is considered dangerous and has no an easy way of doing it (actually you can, but is a very advanced and delicate task). With "hg remove" a file can be marked to be removed from repository, so "hg log" shows it with a "R" that means that marked file will be removed from repository in next commit. you should use "hg update 1" because of "changeset 1:...", do you see it?. Main point is that "hg log -l 1 code_2.txt" shows you last revision in which that file existed because it was modified. With that revision you can make Mercurial rescue desired file from there (" hg revert -r 0 code_2.txt"). And finally commit rescue. Now lets raise bets. Sometimes you want to try developing new features but you don't want to mess your tested files. That's where branches gets into play. You create a branch to develop over a separate copy of main branch (called "default"). When you are sure brach is ready to get into production you can merge the branch with main branch mixing changes into stable files from main brach. "hg branches" shows branches in repository but they are not really created in repository until you commit (with "hg commit") them after "hg branch", that's the reason because first "hg branches" shows only default branch. When you change from a branch to another files are removed and created to recreate branch files layout. Closed branches can be reopened just jumping in them with "hg update" and then commiting. So far you have learnt the basics top work with Mercurial in your local source code folder. Usually it's hard to remove accidentally a hidden folder like ".hg", but you might loose your hard drive by a hardware malfunction (or you can mistype a "rm -rf" as I did while I wrote this article), in that case your repository would be lost. Besides when you are working with a team you will need a central repository where to merge advances of any member into the main (default) branch. Bitbucket is the answer for both needs. So we are going to see how can we keep a backup of our repository in Bitbucket's cloud. You can configure your repository as public or private, set it to be used with Git or Mercurial or even include a Wiki in the repository webpage. If you are working with a team of five members or less Bitbucket will offer their services to you for free. Pay attention to "." after hg clone's url if you don't use it downloaded files will be placed in a folder called "sourcecode" into "source2". After a clone, its a good practice to do "hg update" to be sure you are working in most updated version of project. In case of conflicts like this, "hg merge" opens a paneled editor (not shown here) so you can compare versions of the same file and modify your local copy to not to conflict with the one from Bitbuckets. I'd better use console mode with Mercurial than use one of those GUI apps out there (like TortoiseHG), but I have to admit that console editor that uses Mercurial is based on Vim and is rather awkward (I'm more fond with Nano editor). Once merged and commited, you can see that total heads have reduced again to two (one per branch), so this time push to Bitbucket goes nicely. With all these tools, a team of developers can work simultaneously without stepping in the toes of one and another. But Bitbucket offers you a way to contribute with a project even if you are not part of its developer team and have no write access to their repository. That way is called forking. When you fork a Bitbuckets repository what happens in the background is that that repository is cloned in your Bitbucket account. Then you have the chance to write and test modifications against your own repository. Once your code is ready, you can ask for a "pull request" to the original owner. If he accepts, a merge between the two repositories will be performed and your changes would be incorporated to original repository. OK, this is the end of the article. 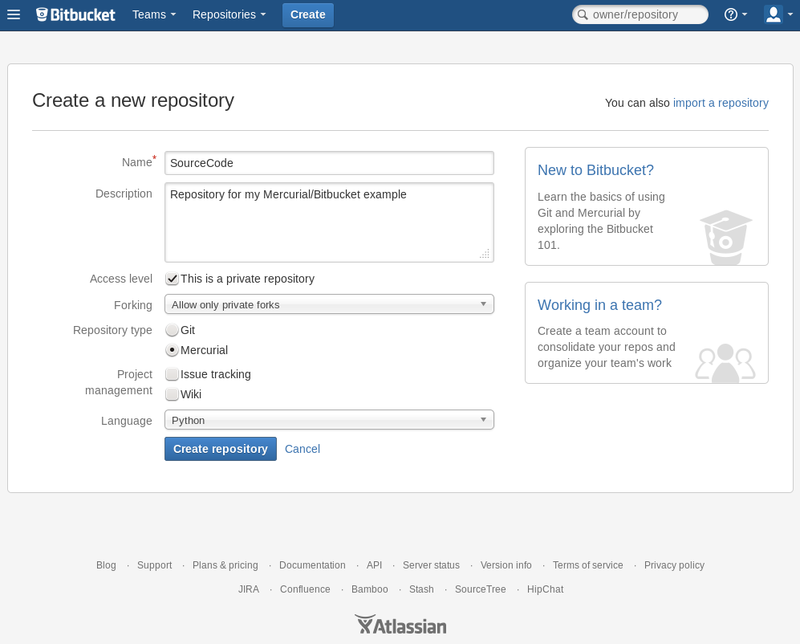 You now master the basics of version control with Mercurial and Bitbucket. I'm sorry for the extension of the article but I wanted to cover all the usual topic you may meet in an average indie project. Mercurial and Bitbucket have a lot of additional options and refinements but you usually would meet them in more complex projects. And at last, I don't want to end this article without mentioning that most of this article's concepts are similar to those used in Git and GitHub. Try this official introductory tutorial to Git and you will realize how similar is to Mercurial.